Cyberpunk is a beloved subgenre of science fiction that pits the societal underdogs against oppressive totalitarian regimes, and are often set in futuristic, technological worlds. Since the development of the genre in the 1960s, cyberpunk worlds have enthralled and fascinated audiences around the world. Born Punk, an upcoming point-and-click adventure game, embraces all of the elements that we love about cyberpunk games. Set in the Danish territory of Bornholm, you play as former combat hacker, Eevi, who is infected by what is possibly a rogue A.I. She must figure out where this infection came from, and decide whether she wants to keep it, or eliminate it. In the midst of her quest, she’ll uncover a conspiracy that could impact the very future of humanity. Stop scrolling down for a second and just take a moment to appreciate this screenshot, okay? LOOK. AT. THE. DETAIL. We can see the rain outside the window; the lines of the subway tiles on the walls; and don’t even get me started on the use of lighting. Fully Voice Acted – According to Born Punk‘s upcoming Kickstarter, every character in Born Punk will be fully voice acted. Eevi is voiced by U.S. Army veteran and actress Linsay Rousseau, whose previous work includes Fallout 76, The Elder Scrolls: Legends, and Sailor Moon. Eevi is a gruff, grumpy character, which makes her somewhat unlikable, but Rousseau’s voice gives her the biting sense of humor and vulnerability that I enjoy. It made me care about Eevi as a person and what she’s going to do. 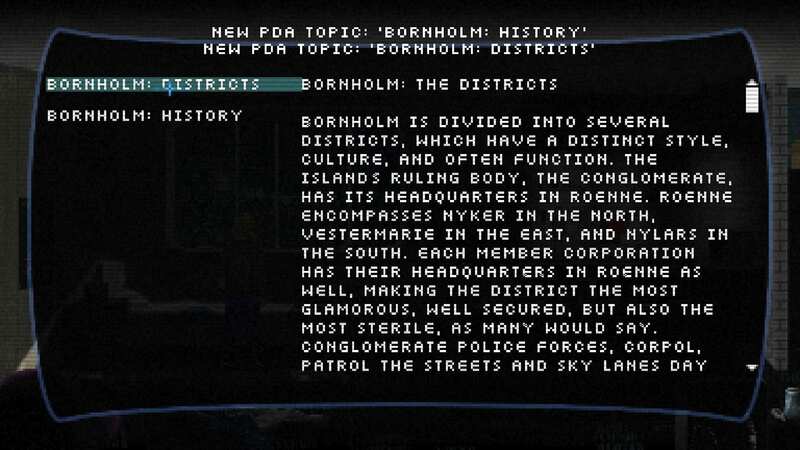 This is an image from Born Punk‘s Kickstarter, which provides an overview of the city of Bornholm. There are different sectors within this massive city and, as you can see, each one has its own distinct design. Fantastic Audio – One of the things that interested me about Born Punk was that Jeff Kurtenacker, known for his work on Wildstar and World of Warcraft, is composing part of the soundtrack. The music is high energy, blending electronic and rock together. While I didn’t get to hear much of it in the demo, I did get to listen to the main theme, which is a lot of fun. PDA System – Like many other point-and-click adventures, you can interact with objects in your environment. But Born Punk takes this a bit further: when you touch an object, you gain more lore and knowledge about the world around you. This knowledge is collected in your PDA system. When I was introduced to the system, I thought, “Wow, so basically I just get to do a ton of reading to learn about the world around me?” But it’s not so simplistic. When you gain knowledge, you also gain additional options that can be used in the future, like methods to solve puzzles or other dialogue choices. This adds another level of entertainment to the game, and motivates the player to carefully explore each environment they enter. SO. MANY. CHOICES. – When you play Born Punk, there are a variety of objects that you can interact with in different ways. Click on an object, and you’ll have the option to shoot or claw at it with your cyborg hand, or interact with it nonviolently. These options can impact future choices. But you don’t just have decisions to make when interacting with items, you have dialogue options that can impact the game as well. 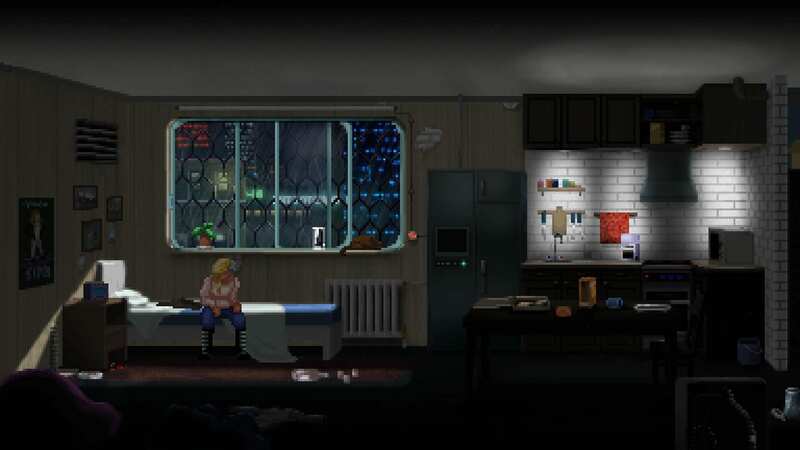 These are impressive mechanics for a point-and-click game. Direction of Plot? – While I have a strong understanding of the world and the main character, Eevi, I’m not quite sure where Born Punk is going to take us. Playing through the demo, I gathered that Eevi is infected with some sort of virus, and that she was dealing with a killer hangover. When I looked at the game’s Kickstarter, I got more details that I didn’t gather when I was playing the demo. I just wanted more of an idea about where Eevi’s journey will take her. Cast of Characters Not Present in Demo – It took me approximately half an hour to make it through the demo of Born Punk, and the only people that I met were Eevi and the virus in her brain. While I got to know and appreciate Eevi’s persona, I was kind of confused that there were no other major characters present in the demo. After I played and I looked on the game’s Kickstarter, I saw that there was a large cast! I realize that I sound greedy asking for a longer demo, but if there are people who play a significant role in Eevi’s adventure, I want to get to know them! Standing Out Among Cyberpunk Games – By playing through the demo, I can see that Born Punk stands out from other point-and-click games. From its art style to its mechanics to its dialogue choices, there are plenty of reasons as to why point-and-click enthusiasts would want to play Born Punk. But there are a lot of cyberpunk games out there: VA-11 HALL-A, System Shock, Deus Ex…the list goes on. One challenge for Born Punk is going to be standing out in the genre. But am I doubtful of the developer’s ability to do this? No. An example of dialogue choices that you can make in the game. While the demo demonstrated many of the game’s intricate and advanced mechanics, I wish that I had gotten to interact with the world and other characters. Had the demo been just a smidge longer, I think that it would’ve addressed my concerns. 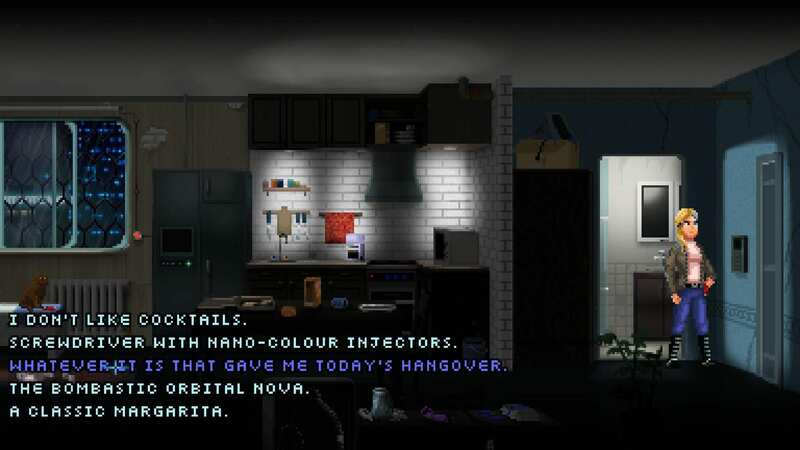 But despite that, Born Punk is an ambitious point-and-click adventure game, and I’m excited for the full version. Between the voice acting, art, and music, there’s more than enough to enjoy, and the team behind it is more than talented enough to pull it off. The Kickstarter for Born Punk launches on Tuesday, February 5. The developers are aiming for a goal slightly over $10 thousand Australian dollars, or about $7,250 US dollars. To check out the Kickstarter, click here. Additionally, if you want to check out the demo of the game, you can grab it for free on itch.io.